Laynson Lim: When it rains... it pours - Hit and Run accident??? 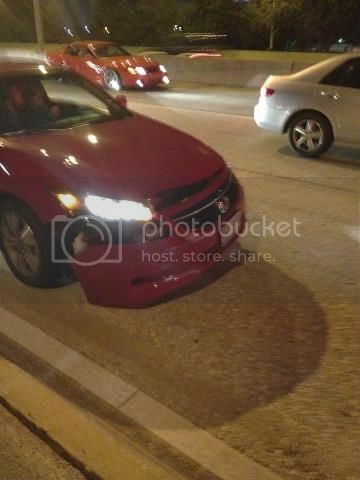 When it rains... it pours - Hit and Run accident??? The saying is so true, when it rains, it pours. So, mama and dada were so worried about your tummy issue yesterday and left late. We typically leave earlier but we had to make sure that your temp is fine, etc before we left. We were driving the White Altima, the loaner since our GTR's transmission is dead. Yes... it's dead and we only have 16K miles on that 3 year old car. We hardly use that car, that car was used by mama to fetch your Yee Ko to see the doctor when he was in mama's tummy and also to send you to the doctor while you were in mama's tummy. Mama hardly drove the car over 80 mph. I still remember someone asking mama, how fast have you driven this thing??? I said never over 100?? Of course, I care about my insurance and accidents. Anyway, we were passing through Addison and all of the sudden, we saw all the car stopped, so, we slowed down and passed by a White G35 because that car just hit another truck and a few seconds later, we head a loud tires skidding sound and before we know it... BANG..... and we felt the impact. CJ got down to check on the car, then saw that we still can move, so, CJ told the Red Honda who hit us to pull over, because we didn't want to block all the lanes. 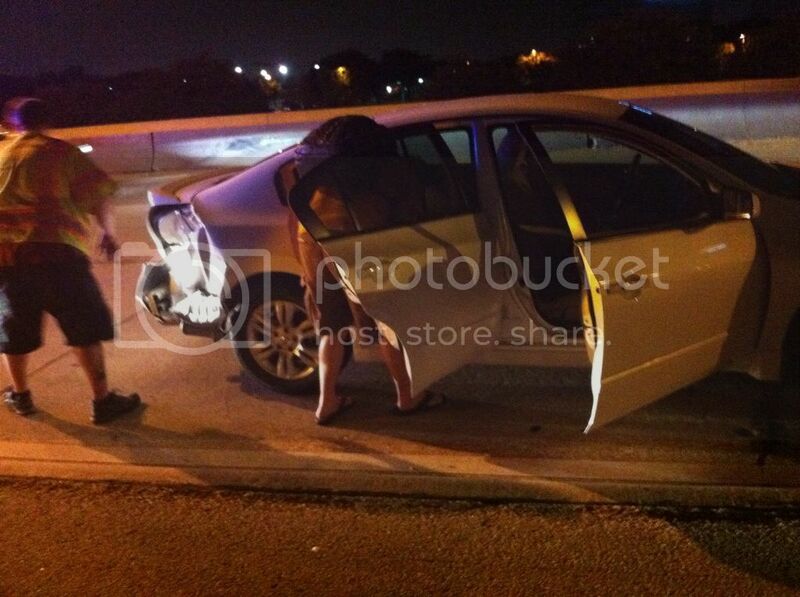 We move the car to the side and all of the sudden, we heard that the girl just spun off and left. I started feeling nauseated and felt like throwing up. I walk to the side and 2 people were very nice asking us if we needed help. I told CJ to quickly go get the girl since this is not our car and we need her to pay for what she did. 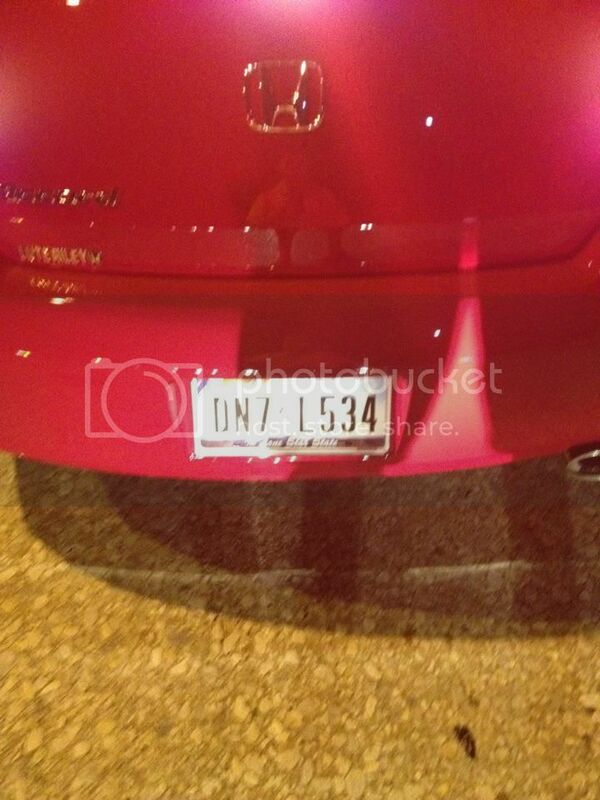 CJ managed to get her plates, DN7 L534. It's a new Red Honda Accord. Here is the damage on the loaner. 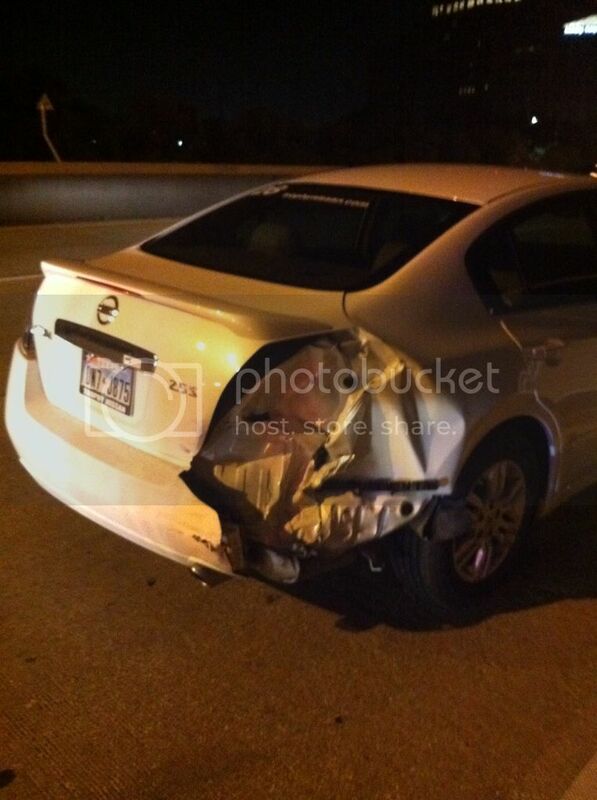 I wasn't feeling well after we got hit, I got down the car and felt nauseated and threw up a few times. The paramedics came, checked my oxygen and blood pressure, it seems to be ok but since I just had a c-section, they asked me to go to the hospital. Heck no.... I don't want to waste 4-5 hours of my beauty sleep because I don't think anything serious happened to me. So... dad came to pick us up and by the time we got back home, it was almost 3am... what a day!!!! I was already worrying about you, not having pee pee for hours and concern about your huge belly, now this???? 3rd time changing the trach - SUCCESS! STRONG??? I am not as strong as you think. Haddad Syndrome.. What??? Another term? Dada left for Phoenix again & Got a scary call? Baby's First July 4th - Another rough day.